Hawaii is facing down a looming elder care crisis. Elder Care Is a Looming Crisis. Hawaii Is Facing It Head-On. In Hawaii, senior citizens are kupuna. The Hawaiian word, used in roughly the same way as elder or grandparent, denotes reverence for experience and wisdom. Throughout history, Hawaiian culture has placed a high value on children and grandchildren caring for their kupuna, helping them age with dignity in their own homes and communities. The bill sputtered out on the governor’s desk. But a new elder-care bill that recently passed both chambers of the Hawaii legislature looks poised to make it all the way into law. Advocates say the program it establishes will help people live up to the responsibility Hawaiians feel for their kupuna, rather than trying to replace the strong existing tradition of elder care. If Gov. David Ige signs this legislation, people who work at least 30 hours a week outside the home and serve their kupuna as primary caregivers will be eligible for up to $70 a day in help from trained home aides. The Kupuna Caregiver Assistance Program would help a family caregiver continue to work outside the home, get some necessary breaks in caregiving work, and give her the money to pay a fair wage to the care workers she hires. It’s an important step toward meeting the needs of a fast-aging population and the family members who are expected—but too often financially unequipped—to shoulder the burden. States around the country are preparing for a crisis in elder care as baby boomers age and develop debilitating age-related conditions. According to U.S. Census projections, by 2030, more than one-fifth of the U.S. population will be 65 years of age or older, up from 13 percent in 2010. But Hawaii is facing an even more urgent demographic shift. At 82, the Hawaii life expectancy is longer than any other state’s, and some analysts predict that 30 percent of the population could be 65 and over by 2030. The high cost of living on the islands exacerbates the financial strain of aging for seniors and those who care for them. According to AARP Hawaii, private nursing homes in the state charge almost 50 percent more than those in the continental U.S., and home health care costs thousands of dollars more than the U.S. average. Given those major potential costs, $70 a day for family caregivers is an efficient use of the state’s money. The median hourly wage for trained health aides and care workers in Hawaii is between $10.61 and $12.72 an hour, depending on expertise, which is significantly less than what experts consider a living wage in Honolulu. 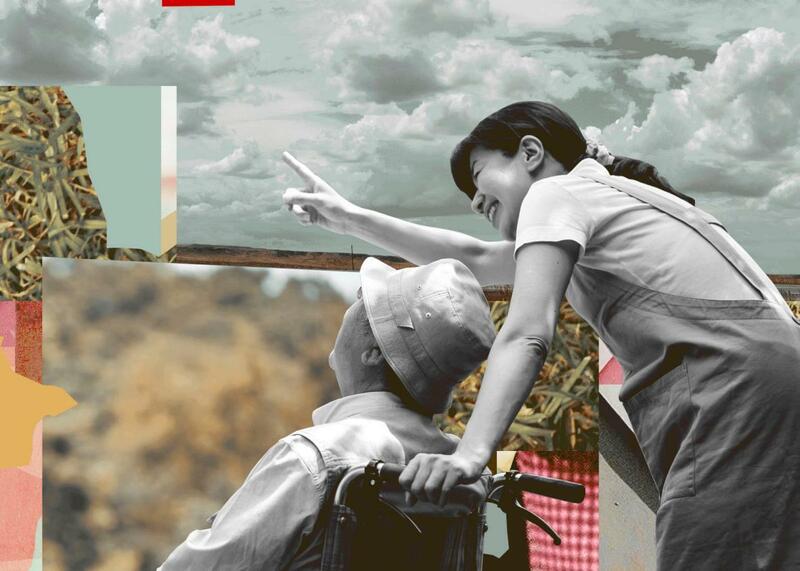 Ai-jen Poo, director of the National Domestic Workers’ Alliance, says many families that need home-care aides can’t afford to pay them a living wage. In some cases, they can barely make ends meet themselves. “In Hawaii, we’ve heard time and again that it’s not wealthy people that are hiring domestic workers—it’s people who need some support here and there,” she says. “It’s working families who are…working part-time or temporary [jobs], or they’re self-employed and they’re trying to piece together work.” Families in all income brackets across the country are hiring outside help or combining resources with other families so they can keep their jobs while meeting their responsibilities at home. When Caring Across Generations polled Hawaiian adults between the ages of 45 and 70, one-third reported that they currently help care for an aging person in their home. Most of those unpaid caregivers, like the vast majority of family caregivers across the U.S., are women. Earlier this month, JAMA Neurology published an article on the gendered effects of a population aging into dementia and relying mostly on daughters and daughters-in-law for care. “The best long-term care insurance in our country is a conscientious daughter,” the authors wrote. “It remains to be seen whether men can be persuaded to assume an equal share of the burden of caregiving.” Female caregivers also shoulder a larger career and income toll from their family obligations. They’re more likely to leave the workforce entirely than male caregivers, and they’re nearly seven times more likely to downgrade from full-time to part-time work. Janet Kim, Caring Across Generations’ communications director, says the gender justice implications of the kupuna care bill helped get legislators on board. The bill helps women stay in the workforce, advocates say, which will keep Hawaii’s economy strong and prevent a future elder-care crisis, because women who keep their jobs are safeguarding their own retirement plans. If Ige signs the legislation, Poo and other advocates around the country will be watching Hawaii and measuring the impact of a program that could be a model for elder-care programs in other states. Washington State is considering a bill that resembles previous versions of Hawaii’s, and similar conversations are taking place in the legislatures of Michigan, Minnesota, and Maine, whose population is the oldest in the nation.